Whatever your moving needs may be, our top-rated Burbank movers from Meathead Movers will help you feel at home in Burbank. Our professionally trained student-athlete movers and our moving concierge will be with you for the entirety of your move. Welcome to a vibrant, diverse community of 100,000 with a sublime climate and lots to see and do. If you are looking for Burbank movers because you are relocating to the city, consider yourself lucky! Known as “The Media Capital of the World,” the city is just a few miles from Hollywood and is home to production facilities for several entertainment companies, including Warner Brothers, NBC Universal, Walt Disney, ABC, Nickelodeon, and the Cartoon Network. In fact, while Hollywood gets the glory for the production of movies and TV shows, this city is actually where most of the work takes place. If you watch movies or TV, you’ve already familiar with its charms. Hundreds of films have been shot here, including classics such as Casablanca, High Noon, and Bonnie and Clyde. The ABC show Desperate Housewives used the Magnolia Park area frequently for location shoots and many Three Stooges outdoor scenes were shot in and around here. When it comes time to play, there are plenty of choices. Wildwood Canyon Park and the nearby Verdugo Mountains offer miles of trails for hikers and mountain bikers. Music lovers will enjoy the Burbank Philharmonic Orchestra and live music every night at the Burbank Bar and Grill. Shoppers can prowl the Burbank Village shopping district while tourists take a peek inside the entertainment industry on the Warner Bros. Studio VIP Tour. Whether you are new to town or just moving from the retro-feel of Magnolia Park to the upscale Rancho Equestrian District, you can rest assured that Meathead Movers will treat your precious belongings as if they were our own. Our teams of motivated, polite, strong and clean-cut student athletes jog on the job when they aren’t carrying your belongings—and that saves you time and money! Across California, Meathead Movers’ revolutionary approach to the moving industry ensures that your household belongings get to your new home safely and economically. Our associates, hired from local colleges, are professionally trained and certified, giving you peace of mind and a hassle-free moving day. 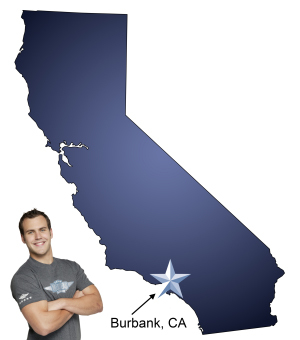 Our moving company specializes in local, long-distance, and commercial moves to, from, and within California. Our Burbank movers also provide reliable packing, storage, on-site relocations, and our distinctive moving concierge service, which connects you to trusted service providers in the area. We deliver outstanding service and value every day of your move with our Burbank movers. With our 100% satisfaction guarantee, the only thing you have to lose is the stress that comes from moving! So contact us today for a free moving quote and to learn how we can help you on your next move! Wonderful job. On time, very courteous and efficient. Would definitely use again. I received the best customer service possible! In addition, my movers found money -- twice -- and gave it to me. I thanked them, not just for the money, but for their honesty. They worked very hard and I will never use any other movers. This is my second time using your services, and both times were the best! I tell everyone about Meathead Movers. THANK YOU! We were very pleased with the guys who moved us! Super service and felt like they really cared about our move. Everyone at Meathead was knowledgeable, professional and very careful with our stuff.